[…] the [Telecommunications Regulatory] Commission directs you to do what is required to block the websites listed in the attached document and prevent your subscribers from accessing them before the end of today, June 2, 2013. Note that the websites that don’t have a URL in the list, you will be provided with later. What followed was a list of 304 websites. 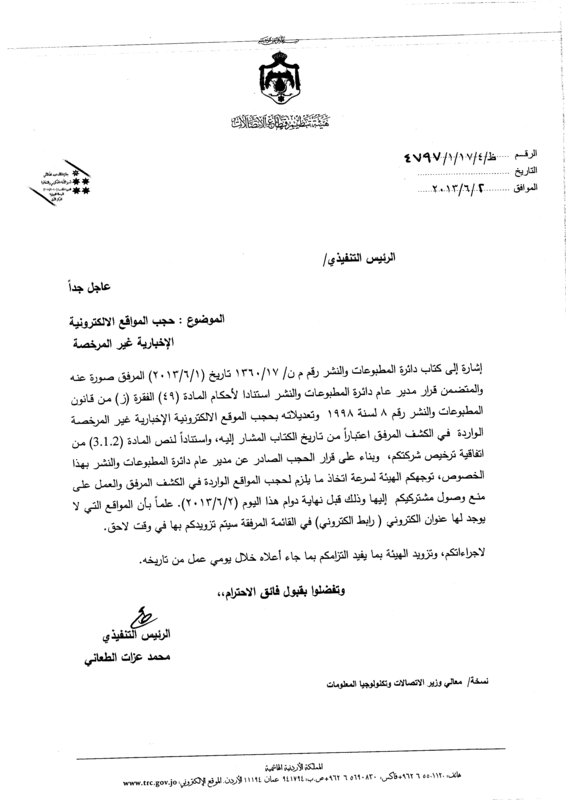 This is the request sent by the Jordanian Telecommunications Regulatory Commission to Internet Service Providers (ISPs) on 2 June 2013, and published by Jordanian citizen media platform 7iber. The request is in line with legislation enforced back in September 2012––the Press and Publications Law. The Press and Publications Department, a state entity once formally known as thee Censorship Department, is now in charge of applying this law. Jordan counts nearly 500 online news outlets. According to the current version of the Press and Publications Law, any such website has to register with the Press and Publications Department in order to obtain a license. Registering is reported to cost 1,000 Jordanian dinars (1,400USD). The websites listed in the blocking request are deemed « unlicensed, » meaning having neither obtained a license nor applied to obtain one. Reportedly, 102 websites remain accessible for either having obtained a license or for having applied for such within the official deadlines. The move caused a deluge of discussions on a wide range of media channels, when Press and Publications Department director denied a fee is required to get registered and after a cement factory website was identified as listed among the websites to be blocked for allegedly manufacturing paper. As no official has offered commentary on these discrepancies, the process through which websites are selected for blocking remains obscure.